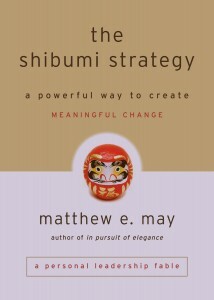 The shibumi strategy by Matthew E. May is both a parable and a lesson on the quiet aesthetic simplicity and transformative energy in Japanese culture. It all starts with Andy Harmon’s sudden misfortune. One day, his company closes. A good husband and good father (very much the image of the perfect, hardworking American for a magazine cover of the 50’s… only several decades later), he can’t just go back home to tell his family that he is out of the job and lament. He has a few hours to find a solution in a small town with virtually no job openings except, perhaps, at the town’s only car dealership. After enjoying a corporate position in a customer service call center, Andy decides to try his luck as a salesman at Mainstreet Motors, something for which he doesn’t initially have the right profile. The result is that he must basically reinvent himself – and he does. Through a Zen self-discovery process, and a fair amount of trial and error, he finds out how to be something else than the stereotypical car salesman, and meets with success by building a long-term referral business.